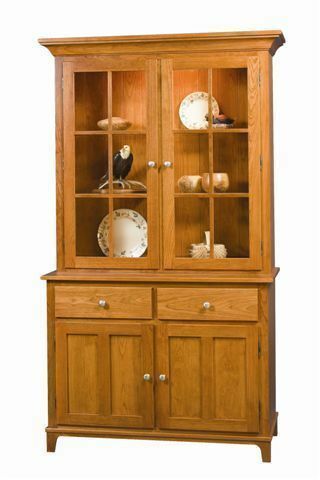 Warm and welcoming in solid wood, the Amish Rydal Hutch is ready for storage and service. Shaker style furniture is beautiful in its simplicity, and this wood hutch features two gorgeous top cabinets, two drawers and two lower cabinets all handmade and hand-sanded in shaker style. The Amish Rydal Hutch features a bar light to add a cozy effect. You can choose to have either glass shelves with plate grooves or wood shelves upon request. Gorgeous raised panels show off the solid wood you select. We love hearing about our customers first reactions when they see their new Amish furniture. At DutchCrafters we love sending home a quality product to become part of your family history. We are happy to offer a 30% down payment plan and flat rate curbside or inside delivery. Select your options online today or call or email to get in touch with an Amish Furniture Specialist. Thank you for shopping with DutchCrafters, the #1 online retailer for Amish furniture.